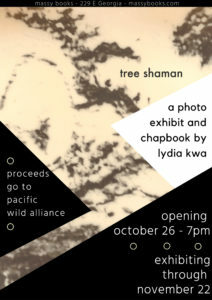 Massy Books is proud to present “tree shaman,” an exhibition of photo-based works and accompanying chapbook by Vancouver writer and clinical psychologist Lydia Kwa. Join us for an opening party on October 26th at 7PM, and stop by any time through November 22 to catch her work in the Massy Gallery. the Parks Board people had to come cut it down. loaded it with film made by the Impossible Project. Lydia lives and works in Vancouver as a clinical psychologist and a writer. She went to University of Toronto to do a Bachelors of Science degree in Psychology, then spent 7 years at Queen’s University in Kingston getting her MA and PhD. While at Queen’s, she started to take her writing more seriously and would drop into a writers’ group that met on the top floor of the Grad Club on Monday nights. In 1989, the poems she submitted to two campus periodicals won prizes. It was also the year her poems were first published in a Canadian literary magazine: CV2 out of Winnipeg, Manitoba. Today, Lydia works out of her own office as a full-time psychologist at the edge of Chinatown and the Downtown Eastside in Vancouver. She has several published books, including: This Place Called Absence, The Walking Boy, Pulse, and her latest work— sinuous, a long poem that spans about fourteen years, and covers various experiences of living in Canada, including her reflections on the nature of trauma, the resilience of the human spirit, and the healing that comes from practices such as meditation and ki aikido.